So last night was the start of the new School of Christian Living classes. This term one of the classes is focused on animal rights, so I’m rising to the challenge to make 6 weeks of vegan meals. I’m going to try to stick to cooking with regular ingredients and limit the use of any vegan replacement products. I’m hoping these recipes will just be a tasty, easy addition that you can incorporate in your meal planning regardless of your carnivore, omnivore, herbivore status. Let’s start with dessert first. This was very popular and I had several people double check that I’d be posting it on here. 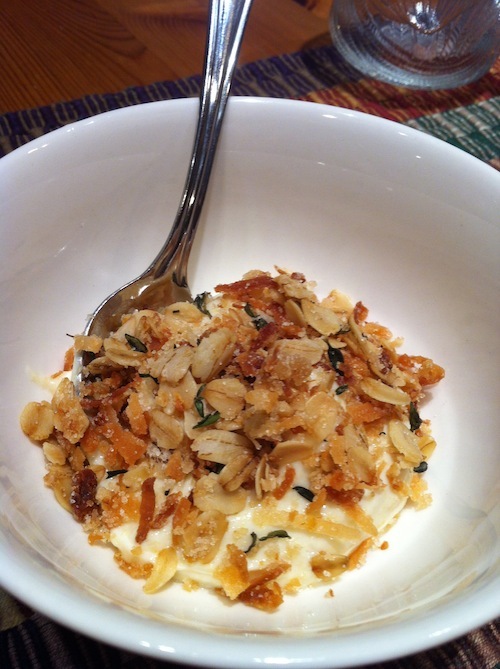 This is a great combination of smooth creme with crunchy topping. The lemon is tart and bright, cleansing the palate. It’s refreshing and light. I was a little skeptical, but the combination of lemon and thyme is delicious and works great as a sophisticated dessert. I kept the lemon creme on the tart side, but the topping is very sweet (I’ll decrease the sugar by a 1/4 cup as reflected below) so the combination works well. If you like it sweeter feel free to add more agave (or honey if you’re not keeping vegan). This is also dairy-free, so great for all sorts of dietary restrictions! I wasn’t aware there was such a thing as extra-firm silken tofu, but I happened to find it at my local Asian market (it was not in the chilled section though, so look on the shelves). Wrap tofu in paper towels and press with a skillet (or something moderately heavy) for about 10 minutes. Combine all ingredients in a food processor (or whisk really vigorously–arm workout for the day! ), blend until smooth, about 1 minute. Refrigerate for at least an hour before serving. Can be made ahead of time. If separation occurs just stir. Preheat oven to 350°F. Grease a 9×13″ pan with cooking spray. 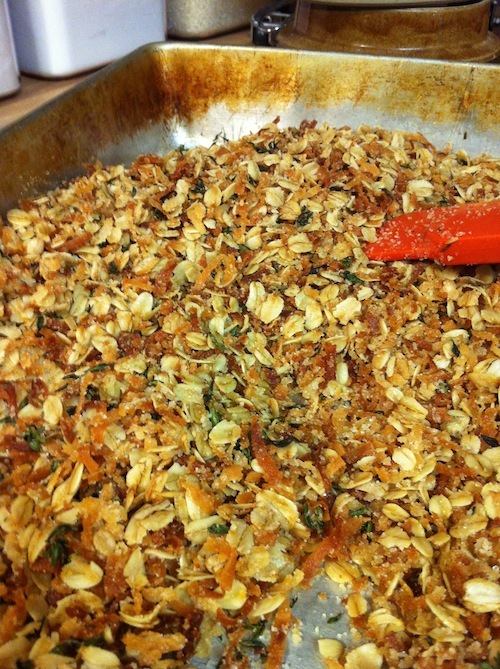 Combine oats, sugar, salt, coconut, and thyme. Stir together melted coconut oil and vanilla extract. Mix together wet and dry ingredients until everything’s well mixed. Place in oven and bake for about 20-25 minutes, stirring halfway through.